On Wesak Day, Buddhists all over the world commemorate the Birth, Enlightenment and Nirvana of Sakyamuni Buddha. This sacred day is purely a religious festival and all Buddhists are expected to reaffirm their faith in the Buddha Dhamma and to lead a noble religious life. It is a day for meditation and for radiating Loving-Kindness. 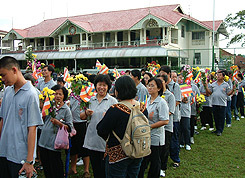 On Wesak day, devout Buddhists assemble in various temples before dawn for the ceremonial hoisting of the Buddhist Flag and the singing of hymns in praise of the holy Triple Gems: The Buddha, The Dhamma (His teachings), and The Sangha (His disciples). Devotees bring simple offerings of flowers and candles to lay at the feet of their great teacher. The symbolic offering of flowers is to remind us that just as the beautiful flowers would wither away after a short while, life is subject to decay and destruction in similar manner as the flowers. The symbolic offering of candles is to remind us that just as a candle gives light to chase away darkness and in the process melts away (“sacrifice itself”), we should be mindful in “chasing” away our ignorance and care for the well being of others. Devotees are enjoined to make a special effort to refrain from killing of any kind. They are encouraged to partake of vegetarian food for the day. On Wesak Day , Than Hsiang Temple holds a Bathing the Buddha Ceremony, Buddha Day Lamp Lighting and Taking Refuge and Five Precepts Ceremony. Significance of Bathing the Buddha Ceremony - Sakyamuni Buddha was born in the Garden of Lumbini, located near the present day of Kapilavastu , Nepal. His mother was Queen Maya and young Siddhartha was the crown prince of the Sakya tribe. At the time of his birth, his mother was traveling home to see her parents and had stopped in the lush garden to rest. After his birth, Siddhartha took seven steps, each treading on a lotus flower. He said he had come into the world to become the Buddha. At this the heavens offered flowers and the nine celestial dragons washed him with fragrant rain that sprang from their mouths. After the bath, the young prince was purified in body and mind. For purity, wisdom, dignity, merit, and virtue. Water is poured over the shoulders of the Buddha and serves as a reminder to purify the mind from greed, hatred and ignorance. 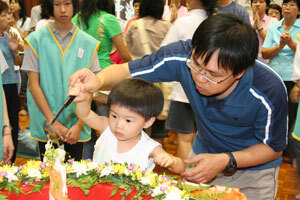 The ceremony symbolizes the washing away of greed, hatred and ignorance and purification of one's heart and mind. Significance of Lamp Lighting - Light is ever a symbol of knowledge and dispelling of darkness. Darkness represents ignorance, and light is a metaphor for knowledge. Therefore, lighting a lamp symbolizes the destruction, through knowledge, of all negative forces: wickedness, violence, lust, anger, envy, greed, bigotry, fear, injustice, oppression, and suffering. 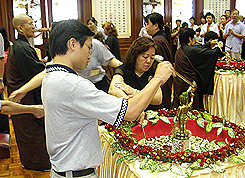 Significance of Taking Refuge and Five Precepts Ceremony - Taking Refuge is what makes one a Buddhist, because in doing so, one accepts (or reaffirms accepting) the Buddha as the perfect, enlightened teacher, the Dharma as the guide to the spiritual path and the Sangha as the supporting spiritual community. These three are also known as the Triple Gems. • I take refuge in the Buddha, wishing all sentient beings to understand the great Doctrine and make the superlative resolve. • I take refuge in the Dharma, wishing all sentient beings to penetrate the Sutra Pitaka with wisdom as unfathomable as the ocean. • I take refuge in the Sangha, wishing all sentient beings to harmonise the multitudes in general, without any obstruction whatsoever, and to respect the sacred Sangha. • To refrain from harming living beings. • To refrain from taking that which is not freely given. • To refrain from sexual misconduct. • To refrain from incorrect speech (lying, harsh language, slander, idle chit-chat). • To refrain from intoxicants which lead to loss of mindfulness. 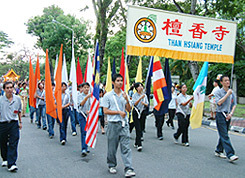 All donations collected during this sacred day will go to the Than Hsiang Welfare Fund to care for the aged and sick.